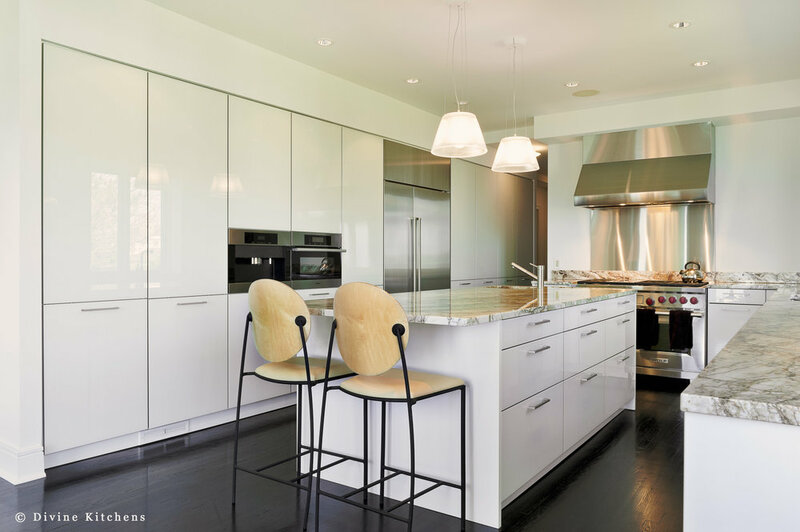 Evoking images of white sands and sun reflecting off water, this oceanfront entertaining space creates a clean, sophisticated profile in a glass kitchen, using natural color palette and material choices. The owners of this property had very specific features in mind, and the design team at Divine was able to create a singular entertaining space to match their vision. The highlight of this vision included ample glass—the perfect material to take advantage of bright ocean sunlight. 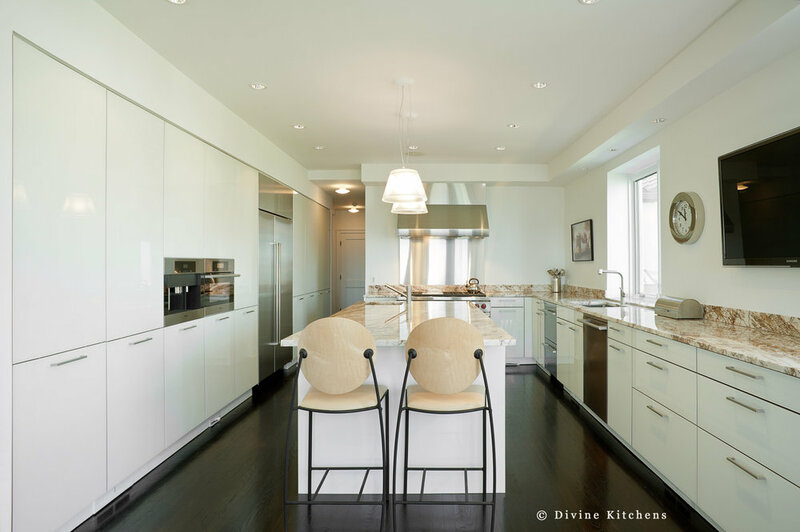 To accomplish this glass kitchen design, Divine used painted, tempered Leicht cabinets to create a luminescent backdrop to this busy entertaining space. To preserve the clean, open look desired by the client, the countertop areas in the kitchen featured no upper cabinetry. To keep with this design requirement while providing ample storage for cooking equipment, serving pieces, stemware, and cutlery, the design incorporated a dramatic, floor-to-ceiling custom kitchen storage solution with pull out storage units and shelving, perfect to accommodate larger pieces and supplies for entertaining large parties. This storage wall also incorporates a double-door stainless steel refrigerator, easy-access coffee station, and speed oven perfect for entertaining. 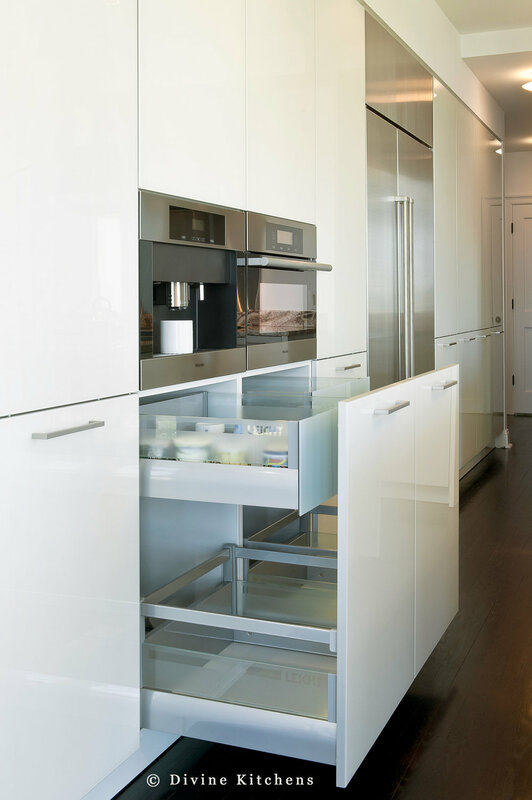 The glass Leicht cabinets in this section of the kitchen creates custom kitchen storage that allows the rest of the fixtures and finishes to take center stage. As a way to incorporate the most storage into the design and provide ample serving area for guests, the large custom kitchen island focused on cabinetry rather than seating. The glass island was topped with a unique, caramel-grained granite countertop to bring warmth to the other color selections. The same granite is used for the L-shaped kitchen countertops and backsplash. All these color elements are brought to center stage with the selection of a deep, chocolate stain for the hardwood floors. 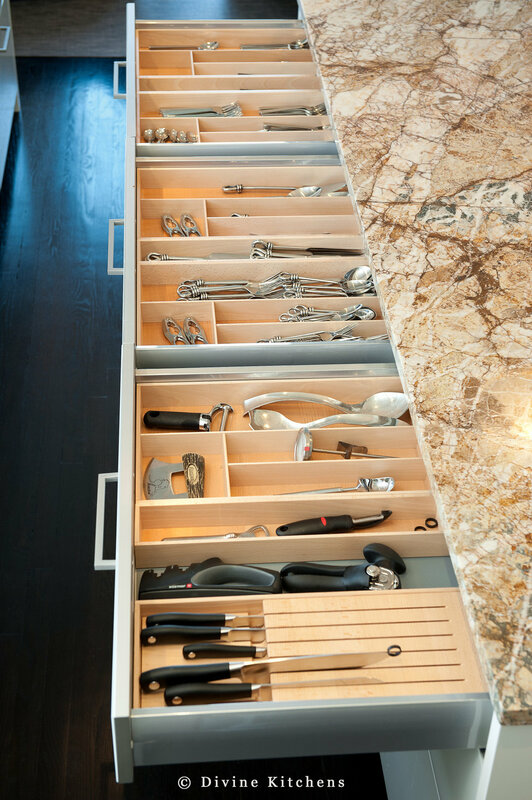 Rethinking the storage of stemware was essential in creating the low-profile look of the space. Using the custom kitchen island as a glassware storage under the counters allows easy access to the serving pieces you need, while removing the visual clutter of storing it on open shelving or in upper cabinet space. The drawers were deep enough to accommodate even tall stemware, which meant they could be safely stored and retrieved during a party. In order to keep up with the demands of entertaining, the appliances and fixtures in the kitchen had to meet the standards of the professional cooking environment. The Divine team was able to create dramatic design elements while still maintaining the high-efficiency functionality required to prep and serve even full course menus for large parties. A professional appliances and stainless vent hood provided both function and form, lending a dramatic focal point to the kitchen space.